1. 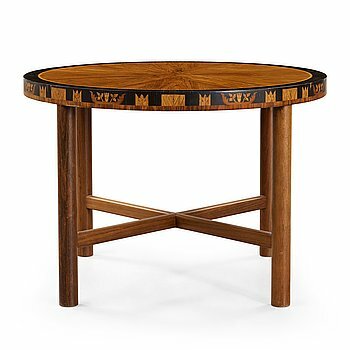 Carl Malmsten, A Carl Malmsten Swedish Grace table, Åtvidaberg, Sweden circa 1934. 2. Carl Malmsten, A Carl Malmsten mahogany partner's desk, Åtvidaberg, Sweden circa 1934. 3. Carl Malmsten, A Carl Malmsten mahogany working table, Åtvidaberg, Sweden ca 1934. 4. Carl Malmsten, A Carl Malmsten mahogny working table, Åtvidabergs Möbelindustri, Sweden ca 1934. 5. 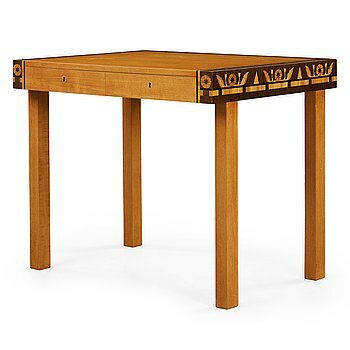 Carl Malmsten, A Carl Malmsten table, Åtvidaberg, Sweden ca 1934. 6. A pair of Swedish grace brass floor lights, 1920-30's. 7. 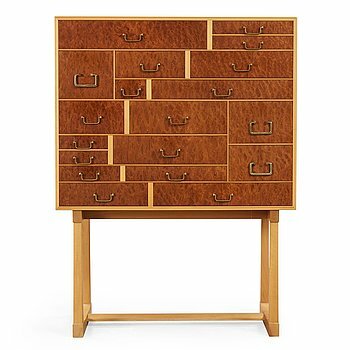 Josef Frank, A Josef Frank cabinet 'Nationalmuseiskåpet', Svenskt Tenn, Sweden post 1985. 8. 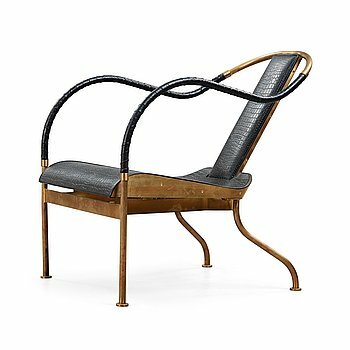 Mats Theselius, A Mats Theselius brass and leather 'El Rey' easy chair, Källemo, Sweden post 1999. 9. 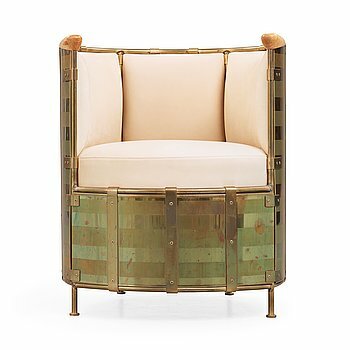 Mats Theselius, A Mats Theselius lounge chair 'El Dorado' by Källemo post 2002. 9A. Mats Theselius, A Mats Theselius 'Elk-leather' armchair, Källemo, Sweden 1991. 10. A Swedish late Baroque 18th century cupboard. 11. A late Gustavian bookcase. 12. A pair of late Gustavian cupboards attributed to Gottlieb Iwersson (master in Stockholm 1778-1813), circa 1790. 13. A pair of Louis XV 18th century corner cupboards. 14. A Gustavian commode signed and dated by Georg Haupt 1784 (master in Stockholm 1770-84). 15. A Gustavian commode by Nils Petter Stenström, master 1781. 16. A Gustavian late 18th century commode attributed to Jonas Hultsten, master in Stockholm 1773-94. 17. A Gustavian commode signed by Jonas Hulsten, master in Stockholm 1773-1794. 18. A Gustavian 18th century commode by Anders Hallmén, master 1755. 19. A Gustavian late 18th century commode by G Foltiern, not signed. 20. A Gustavian late 18th century commode in the manner of Carl Lindborg. 21. 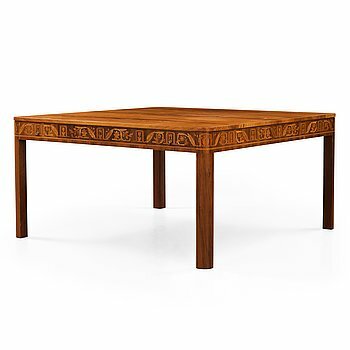 Rokoko, A Swedish Royal Rococo 18th century writing table. 22. A Swedish Rococo mid 18th century console table. 23. A late Gustavian early 19th century console table. 24. A late Gustavian console table. 25. A late Gustavian circa 1800 console table. 26. A Gustavian table by Anders Lundelius 1783. 27. A late Gustavian late 18th century table. 28. A Gustavian late 18th century sewing table by Jonas Hultsten . 29. A late Gustavian table. 30. A pair of Louis XV 18th century armchairs. 31. A pair of late 18th century probably Danish armchairs. 32. A pair of Royal Gustavian late 18th century corner chairs by Erik Öhrmark, master in Stockholm 1777-1813. 33. A pair of late Gustavian armchairs in the manner of Ephraim Ståhl, master in Stockholm 1794-1820. 34. A pair of late Gustavian armchairs in the manner of Ephraim Ståhl, master in Stockholm 1794-1820. 35. A pair of late Gustavian circa 1800 armchairs. 36. A pair of late Gustavian circa 1800 armchairs. 37. A pair of late Gustavian circa 1800 armchairs. 38. A set of twelve Gustavian late 18th century chairs. 39. A Baroque circa 1700 mirror. 40. A Swedish late Baroque early 18th century mirror attributed to Burchardt Precht. 41. A presumably German Rococo mirror. 42. A Swedish Rococo 18th century mirror. 43. A Swedish 18th century Rococo mirror. 44. A Gustavian mirror by Per Westin, dated 1778. 45. A pair of matched Transition mirrors by Johan Åkerblad, master in Stockholm 1758-1799. 46. A pair of wall sconces in the art of Burchardt Precht baroque early 18th century. 47. A pair of Venetian ca 1730 four-light girandole mirrors attributed to Briati family. 48. A pair of Swedish Rococo 18th century one-light girandole mirrors. 49. A Gustavian late 18th century six-light chandelier. 50. A late Gustavian fifteen-light chandelier by C. H. Brolin (1765-1832). 51. A late Gustavian circa 1800 nine-light chandelier. 52. A late Gustavian circa 1800 seven-light chandelier. 53. A Swedish 19th Century thirteen-light chandelier. 54. 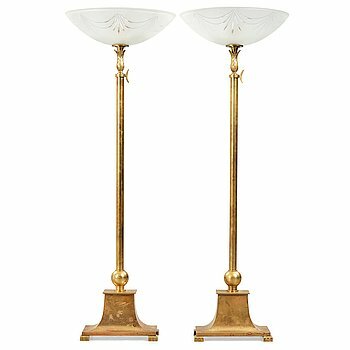 A pair of Empire early 19th century five-light candelabra by Pierre Chibout. 55. A pair of four-light candelabra, Empire. 56. A pair of Empire style circa 1900 six-light candelabra. 57. A pair of late Gustavian early 19th century porphyry and ormolu candlesticks. 58. A pair of late gustavian early 19th century porphyry and ormolu candlesticks. 59. A pair of Empire candlesticks. 60. A pair of Empire candlesticks. 61. An astronomical longcase clock by Johann Joseph Langschwert court-watchmaker, Würzburg, circa 1750. 61A. An English Baroque 17th century longcase clock by James Markwick (clockmaker in London 1666-1698). 62. A Swedish Rococo gilt bronze wall clock by Claes Berg, Stockholm, master 1762-1784. 63. A rococo table clock 18th century. 64. A SWEDISH ROCOCO MANTEL CLOCK, possibly by Nils Berg, Stockholm 1751-1794. 65. A Louis XVI 18th century mantel clock. 66. A French Empire early 19th century gilt bronze mantel clock. 67. A french table clock first half of the 19th century. 68. A Directoire mantal clock. 69. A French Empire mantel clock by Pickard a Paris. 70. A French Empire early 19th century mantel clock. 71. A late Empire mantel clock, first half 19th century. 72. A porcelain and gilt bronze clock, presumably French, Samson, late 19th century. 73. A Louis XVI ormolu and marble centrepiece "Monument Antique", possibly from the workshop of Pierre Gouthière. 74. A Gustavian tea caddy by Georg Haupt (master 1770-84), not signed. 75. An Italian micromosaic plaque by Antonio de Angelis, Rome 1809. 76. An Italian micromosaic plaque, probably first half of 19th century. 77. The pictorial travel journey (scrapbook) of Roger Björnstjerna's (1827-1910) Grand tour in Europe 1857-1859. 78. GEORG SIMON WINTER VON ADLERSFLÜGEL, Bellerophon, sive Eques peritus..", Nuremberg Wolfgang Moritz Endter, 1678. 79. A German 18th century parcel-gilt dish, mark of Johann Gemeinhart, Nürnberg (1727-1739). 80. A German late 16th/early 17th century silver-gilt nef, mark of Heinrich Winterstein, Augsburg (1585-1634). 81. A German 17th century silver-gilt nef, mark of Esaias zur Linden, Nürnberg (1609-1632). 82. A German 17th century silver-gilt cup and cover, mark of Johann Kartenbusch, Nürnberg (1621/-22-1630). 83. A Swedish 17th century silver-gilt spoon, mark probably of Matts Eriksson (Stockholm -1595-1624). 84. A Nowegian mid 17th century silver beaker, unidentified makers mark MC, possibly (Trondheim). 85. A Norwegian 17th century silver roemer, mark of Jochum Hansen Fendt (Skien c 1682 - 1711). 86. A Baltic 18th century parcel-gilt beaker and cover, mark of Joachim Friedrick Kachel (Dorpat 1717-). 86A. A Baltic 18th century parcel-gilt beaker, mark of Johann Christoffer von Haven, Narva (1729-1759). 87. A Swedish 17th century parcel-gilt tankard, mark of Erik Månsson Schmidt, Stockholm (1675-1686). 88. A Swedish/Baltic late 17th/early 18th century parcel-gilt tankard, unmarked. 89. A Swedish early 18th century parcel-gilt dish, mark of Arnold van der Hagen, Norrkoping (1695-1740(-42)). 90. A Swedish early 18th century silver presentation-dish, mark of Petter Bernegau, Stockholm 1711. 90A. A Baltic 18th century parcel-gilt beaker, mark of Johann Heinrich Tenten, Mitau (1732-1739). 91. A Swedish 18th century parcel-gilt beaker, mark of Friedrich Heinrich Klinck, Stockholm 1734. 92. A Swedish 18th century parcel-gilt tankard, mark of Jonas Jaderstedt, Vasteras 1759. 93. A Swedish mid 18th century silver dish, mark of Gustaf Stafhell, Stockholm 1750. 94. A Swedish mid 18th century silver tea-pot, mark of Petter Lund, Stockholm 1750. 95. A Swedish 18th century silver coffee-pot, mark of Axel Johan Limnell, Vaxjö 1764. 96. A Swedish 18th century parcel-gilt cream-jug, mark of Lars Boye, Stockholm 1776.